Curtain Cleaning Where They Hang! 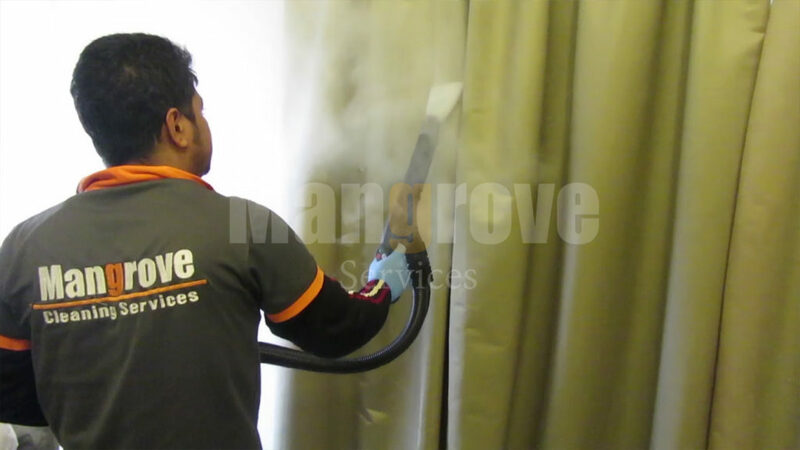 Mangrove Services offer Professional Curtain Cleaning in Dubai. We Steam Clean and Sanitize New and Old Curtains right where they hang! Whether you have just moved in or have fixed new curtains in your house or have the older ones altered according to your new space, it is important that these curtains undergo a thorough Steam cleaning and sensitization. You know how the hygiene conditions are in your place, but you can’t possibly guarantee the Hygiene of the people who stitch or alter or the place where the curtains are stitched or altered. Even if they look neat and clean, there are chances that a variety of Microbes, viruses and fungal spores will travel to your house. Worry not, at Mangrove Services Dubai, we have the arrangements to bring our State of The Art Curtain Cleaning equipment to your place. We shall clean and Sanitize your curtains right where they hang, without exposing your windows and doors and without causing any discomfort to your sleep when sun rises and greets your windows good morning. Your curtains are still going to be there, as a buffer, to ward-off those morning sun rays. What’s more is that you can be assured of a fresh smell off your curtains and in your room. Our equipment emits a dry steam (5-7% moisture content) that makes it possible to let the curtains dry in 4-6 hours provided the A/C is on. At 140-160 C, Steam kills 99.9% of bacteria, fungal Spores and Viruses etc. Our Curtain Cleaning Process includes, Vacuuming, Shampooing, Steam sanitizing and Extraction. This process ensures complete cleaning and sanitization of your curtains leaving them fresh and healthy. We avoid steam cleaning those curtains that are not advised for washing or aqua cleaning. If the curtains are made of silk or susceptible to shrink, we do not advise steam cleaning of such materials. Therefore please check the label for washing instructions if any before summoning a steam cleaning company. If there are no labels and you are in doubt, pre-testing such materials is advised. Members of our cleaning team are not fabric experts. The onus of determining the care or caution about fabric is customer’s responsibility. If there are stains, we spot treat the stains. While 70-80% of stains are removed, we do not guarantee that all stains will be removed. Obviously we can’t oversell and create misunderstanding later. Our Cleaning Specialists will advise you of those stains that can’t be removed. We would appreciate you communicate with them before they start the work if you have any doubts regarding some stains. Call us at 04-3689941 or get a free Estimation and Quote.